Soil moisture plays an important role in the processes of water and energy exchange between atmosphere and ground, i.e. in the critical zone. The quantity is highly variable in time and space even over an area such as a catchment or watershed (less than 1 km2 to more than 100 km2) and a period of one year. 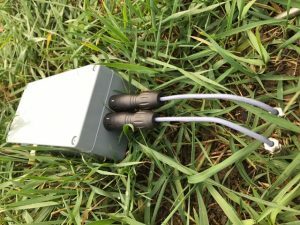 A method to capture this variability and study its importance is distributed sensors monitoring continuously in-situ soil moisture, preferably at different depths over the first 50 cm of soil. These specifications necessitate a network of simple, rugged and autonomous sensors. They would have to measure well representative quantities of the medium, humidity related, and readily available. Sensor achievements take advantage of progresses on electronic as well as on information and communication technology (ICT). For unambiguous data interpretation they must be accurate and reliable, i.e. not affected by instrument bias. 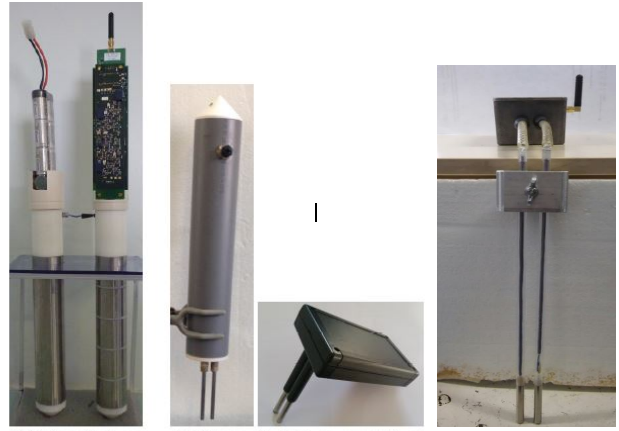 Moreover, such sensors can be used for applications in economic area such as irrigation schedule, control of processes – concrete hardening, compost maturation -, monitoring of silo moisture… Such uses would require lower amount of data but sensors have to cope with challenging media in term of reliable measurement (such as highly conductive ones). To cater for all these applications and meet their requirements in WP 2.3 we are developing a range of sensors based on the same principle (Fig. 1). Field trials are on-going with the first two prototypes, in particular in a sub-catchment in French southern Alps (observatory Draix Bléone). Next sensors benefit from these tests. Fig. 1: Various designs withthe same measurement principle, from a multi-channel sensor to three successive one-channel sensors. The direct and standard method—sample weighting and drying in oven—provides the mass of water content, but is too destructive and human-time consuming for continuous and in-situ monitoring. One of the most promising methods to meet these objectives is sensors sensitive to soil dielectric permittivity. They rely on the dependence of the soil permittivity on its water content. Permittivity measures the strength of medium electric dipoles to respond to the electric field induced by the sensor. The normalized quantity, εr, for water at 20°C is εr = 80, due to its molecular dipoles, whereas it varies from εr = 2 to 5 for a dry soil, and is εr = 1 for air. Fig. 2: Chain of conversions from sensor signal – outputs VC and VG of a self-balanced bridge – to soil water content and its salinity. εr and σ are the apparent soil permittivity and conductivity while C and G are the capacity and conductance of sensor electrodes in soil, which form the admittance Y. Already many sensors have been developed along this principle. Actually each uses a particular measurement technique: travel-time of electromagnetic waves along a guide in soil, or determination of the capacity of sensor electrodes in soil either by the frequency of an oscillating circuit or by a cycle of capacitor charge and discharge, or by coefficient of wave reflection in a coaxial line… These techniques are simple enough for commercial applications, but make the sensors prone to bias, as their determination of the permittivity is too indirect. Any variation of instrument signal due to a parameter other than the medium water content results either from the influence on εr of other medium characteristics, such as its temperature or composition, or from a direct influence on the signal independently of the value of εr, a bias, or, worst, from both. A high apparent conductivity σ, which results mainly from medium free charges, modifies in particular the signal. A solution consists in a signal treatment using data of σ acquired in same conditions as εr, if available. Large part of manufacturers have added for their very recent products σ measurement capabilities, however, either with a technique independent of εr one or at low accuracy. Medium temperature is now measured as well. Acquisition of medium conductivity and temperatures permits as well to provide further insights on the medium. Bridge sensitivity parameters Geq and Ceq are fixed by components between 3.0 and 50 mS/V, and between 20 and 30 pF/V, respectively, depending on applications. Factor g depends on electrode geometry and varies from 0.12 to 0.15 m. Bridge voltages present a resolution of +/- 0.2 mV for a range up to 3.5 V. They are easily digitalized with the same resolution. After taking into account all instrument parasitic effects, sensor specifications permit to cover the range 0–1 S/m for σ (or 0–150~mS for G) and the range 1–100 for εr (approximately that for C in pF), with an accuracy of +/-(1 + 1% σ) mS/m for σ and +/-(0.1 + 1% εr) for εr. Fig. 3 shows the accuracy at low values of permittivity and conductivity assessed with dry sand. Fig. 4: Layout of our wireless network of autonomous sensors, from sensor processor to base station consisting of a computer. Fig. 4 presents the main features of a wireless network of autonomous sensors, as it has been implemented for our project. On-board processor and its software perform the continuous sensor operations (timely acquisitions, basic treatments, storage, communication…). Memory is able to store more than 200 days of trial at an acquisition rate of one point each 15 minute, in the case of a sophisticate multi-channel sensor with two bridges (for the study of frequency influence). A computer equipped with a dongle supervises the network of sensors, and each of them. It visualizes their transfered data (Fig. 3 and 4). For simpler applications like moisture and nutriment monitoring in greenhouses a low cost prototype is developed with a connection according to the need. Fig. 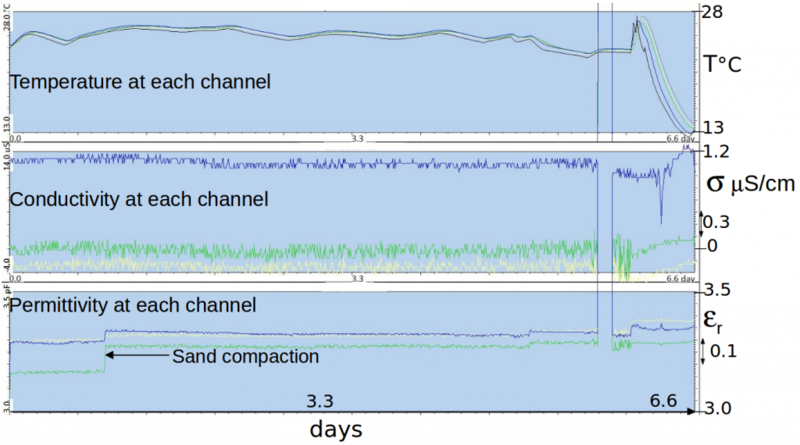 5: Time series of data recorded at different depths by a multi-channel sensor in a clayey sand during a dry and hot period (continuation of the series in Fig. 3). Diurnal cycles of soil temperature and its influence on medium permittivity and conductivity are clearly visible. Fig. 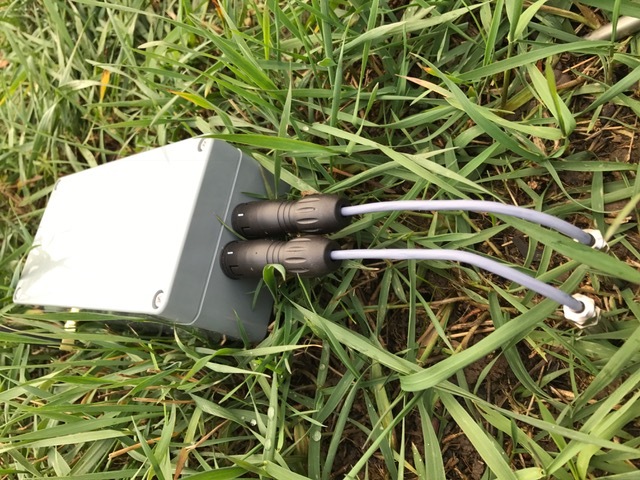 5 and 6 present time series recorded with a multi-channel sensor and a one-channel sensor during field trials at different conditions. Permittivity and conductivity at each level follow the medium hydric state, being either dry, or wet with a precipitation. 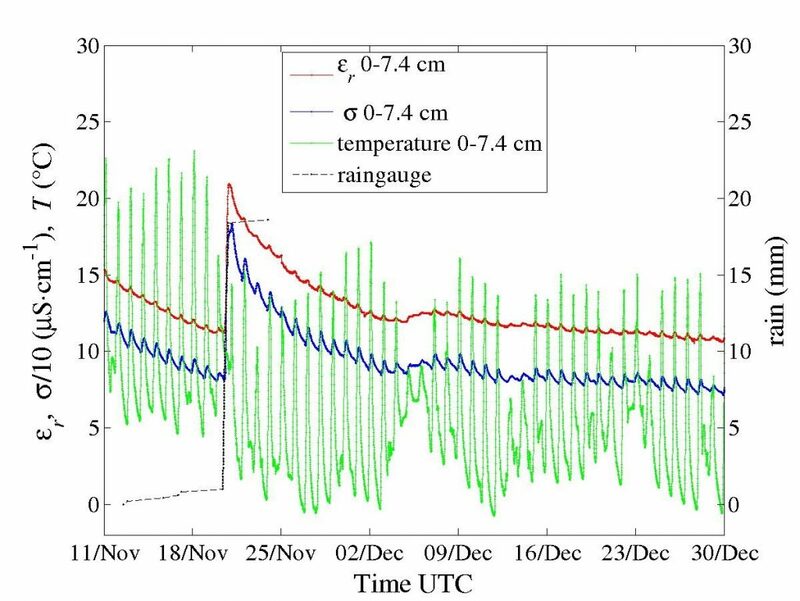 In both cases bulk permittivity and conductivity, εr and σ, are positively correlated to diurnal cycles of temperature, in particular in dry condition. Correlation for σ is related to the increase of the ionic conductivity of pore water with temperature, while the effect on εr results probably from dipoles of bound water, of which contribution is more important in a dry soil. Fig. 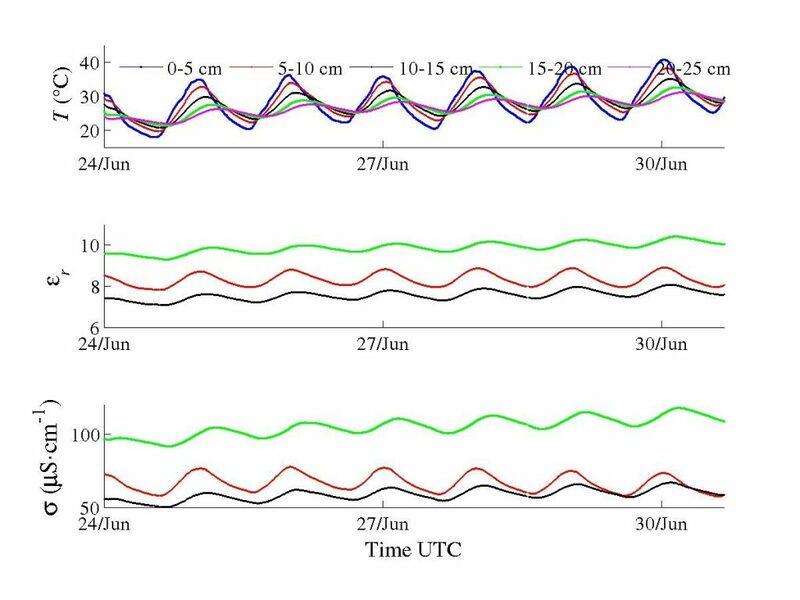 6: Time series of data recorded by a one-channel sensor in the first 7 cm of a calcareous clay of a mountainous observatory during a wet period. Fig. 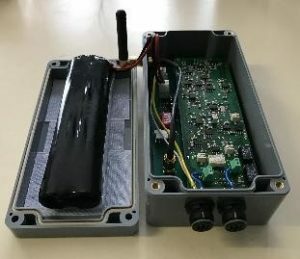 7 presents the on-going development for a simplified and autonomous sensor in wireless communication, with minimal perturbation of the environment.